Thailand is a country in the south-east of Asia. 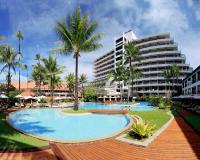 It is known for its beautiful coasts on the Andaman Sea and the Gulf of Thailand. Thailand is divided into the regions Northern Thailand, Isaan, Central Thailand, Eastern Thailand and Southern Thailand. Bangkok is Thailand's capital and known for its bustling nightlife and plenty of tourist attractions. Other popular cities in Thailand include Ayutthaya, Pattaya, Kanchanaburi, Chiang Mai and Sukhothai. Bangkok Airport (BKK) is the busiest airport in Southeast Asia. You can also travel to Thailand by train, road, bus or ferry. With its hot climate and interesting culture, Thailand is very popular with tourists and you should not miss the unique experience of a trip to Thailand. The Travellers Guide has a selection of 3 star, 4 star and 5 star hotels, guest houses and bed & breakfast accommodation in Thailand, listed below. Please view our hotel offers page for the latest "early booking", "spa break" and "free night" special offers for a range of hotels in Thailand.